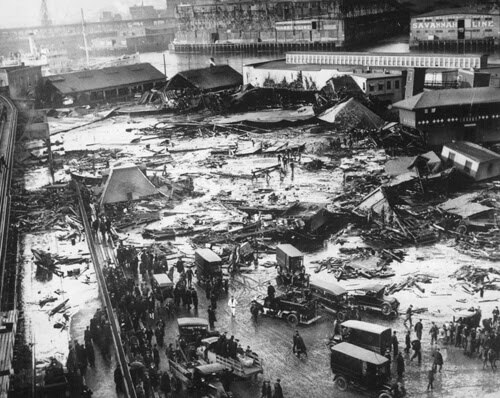 On an unusually warm day on January 15, 1919, the Purity Distilling Company faced disaster. Molasses, a favourite sweetener was being stored there. It was popular because it could be fermented into rum and ethyl alcohol. The rather large tank was awaiting transfer to the Purity plant situated between Willow Street and what is now named Evereteze Way in Cambridge, Massachusetts. It suddenly collapsed. The rumble resounded loudly and shook the ground. Huge waves of molasses between broke the girders of the adjacent Boston Elevated Railway's Atlantic Avenue structure and lifted a train off the tracks. Buildings were swept off their foundations and crushed. Waist deep molasses covered the street, sweeping and covering people and animals in its wake. The Boston Globe reported that people and vehicles alike "were picked up by a rush of air and hurled many feet." 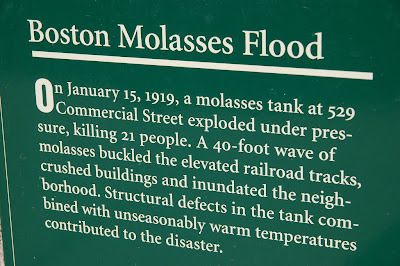 21 people and several horses were killed, most crushed and drowned by the molasses. Coughing fits became one of the most common ailments after the initial blast. Rescuers ran several blocks toward the accident. They worked to keep the curious from getting in the way of the rescuers while others entered into the knee-deep sticky mess to pull out the survivors. Some nurses from the Red Cross dove into the molasses, while others tended to the wounded, keeping them warm as well as keeping the exhausted workers fed. Many of these people worked through the night. The injured were so numerous that doctors and surgeons set up a makeshift hospital in a nearby building. Rescuers found it difficult to make their way through the syrup to help the victims. It took four days before they stopped searching for victims; many dead were so glazed over in molasses, they were hard to recognize. Two found on the fourth day were never identified. Clean up efforts took over 87,000 man hours to remove the molasses from the cobblestone streets, theaters, businesses, automobiles, and homes. The site is currently a recreational complex, officially named Langone Park, featuring a Little League ballfield, a playground, and bocce courts. Here are the names of some of the men and women who died that day. A small plaque at the entrance to Puopolo Park, placed by the Bostonian Society, commemorates the disaster. Thank you for posting those names. This incident reminds me of BP, and what the giant international corporations are doing in this election. It's hard to look at those names, too, without thinking of the Vietnam Memorial. The names must not be forgotten. What an awful tragedy! I have never heard about this before. It must have been a terrible way to die, I do not even wish to imagine it.